Higher or lower: how does Michael D's new salary compare to other heads of state? The new President of Ireland will be paid the reduced capped wage of just under €250,000 per annum – but for the size of our country, is that a good deal? 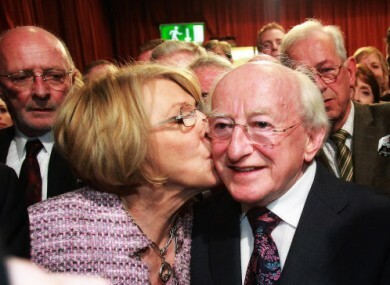 Michael D Higgins gets a kiss from wife Sabina Coyne as it becomes clear that he's in line to become President of Ireland - and for a €250,000 pay packet. MICHAEL D HIGGINS is set to earn up to €1.75 million over the next seven years at the Áras. It got us thinking – is this too much or too little for a head of state to earn? Is it just right? TheJournal.ie has taken a look at the salaries of some other heads of state with a largely ceremonial role. What do you think, is €250,000 an appropriate salary for Ireland’s head of state? Email “Higher or lower: how does Michael D's new salary compare to other heads of state?”. Feedback on “Higher or lower: how does Michael D's new salary compare to other heads of state?”.